This shouldn’t come as a surprise, but actively involved dads are everywhere. Just don’t tell Similac. In its world, dads don’t exist. They’re invisible. They’re transparent. While trying to find common ground among formula vs. breastfeed moms, Similac has managed to make dads feel like they can’t be part of the discussion. Regrettably using the word motherhood as a synonym for parenthood, the marketing team of Similac turned what could have been a creative endeavor into one poorly executed promotion. Similac’s rather ambitious marketing campaign, “Welcome to the Sisterhood of Motherhood,” leaves very little doubt as to whom it speaks. The premise tries to focus on eliminating the divide among moms who breastfeed, and those who formula feed. There’s only one serious problem with it – they forgot about dads. If you dads agree after reading our assessment, here is your exhortation: take to Similac’s Facebook and Twitter sites, and let them know how you feel (plenty have already), because our staff spent an entire day picking apart nearly every facet of this awkward and confusing campaign. We see two slogans in use here, so let’s take a look at each. “Welcome to the Sisterhood of Motherhood” is its primary push, and it’s catchy enough, but it radiates exclusion through-and-through as it tries to address the breast vs. bottle issue. It’s a catchphrase that leaves dads out of the message, as if they don’t feed kids and that dads shouldn’t be a part of the debate. And as mentioned, it swaps out the word parent for mother, a dangerous and exclusionary approach. It’s a curious one, too. Similac makes baby formula, something dads can handle, unlike the actual act of breastfeeding. It was Similac’s chance to strike while the iron was hot, and instead left dads in the cold. 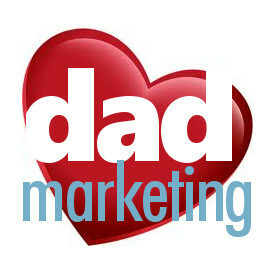 Indeed, leaving dads out of the marketing message in this modern world is risky business, where it only takes a small group of people to band together and give one company a lot of bad press. Just go ask Huggies how it feels to be called out for not thinking a campaign all the way through. Similac’s other motto, “Where moms get encouragement, not judgment,” is surely a dose of unexpected irony whereby Similac effectively passes judgment on dads, believing these are still times when only moms purchase formula and feed kids. That’s a curious assessment, because many dads we know actually purchase the formula, often picking it up to-from work, or on a lunch break, or as stay-at-home dads. Yes, Similac kind of took the search out of research, because it clearly didn’t go barking up those dads’ trees. Dads are often forgotten and ignored, and Similac ensures that will happen right from the very start – you can notice it nearly every post on Facebook, where Similac’s social media group is simply unable to type the letters d-a-d anywhere. This is especially surprising from a company who should want to actively engage with dads, because as already mentioned, formula feeding is something guys can do themselves, no mom needed. Talk about total oddity with an utterly hollow commitment surrounded by dad exclusionary messages everywhere. Read other Facebook posts here, where it’s more than just dads who are scratching their heads. Here’s an oh-so simple reminder for the Similac team: it takes a female and a male to create a child. So, starting with that very basic premise, it seems that a decent courtesy would be to try and give the dad some dignity and recognition at similac.com. Since we’ve already established that similac.com doesn’t speak to dads, it makes the “My Baby” tab at the top look a tad bit possessive and controlling, doesn’t it? Asking for a special fathers section tab is probably too giant of a step for Similac, but at least acknowledgement of dads as parents might be a polite consideration. Expectant moms, don’t miss out! Join the discussion. 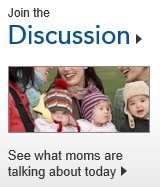 See what moms are talking about today. We could go on and on, but you get the point. We all know dads aren’t wired for breastfeeding, but they do care about their child’s nutrition, and can and should have a say in the breastfeeding/formula discussion. They have feelings, and want to join in the discussion. And they don’t want to miss out. If we didn’t know better, we’d think Similac’s execs were hanging out with the dad-unfriendly Boppy, Jif, Kix and Gerber crowd. It’s not exactly a way to endear itself to the other half of the parent equation, who know how to use credit cards and cash every bit as moms. It’s true, we’ve actually seen dads in stores. But judging by Similac’s presentation, you’d swear that fathers have no ability to choose the proper formula from a store shelf, transport it to their homes, measure the powder, mix it with water and hold it up to a baby’s mouth. Alas, similac.com is beyond disappointing, one of the more troubling sites we’ve seen. Well, imagine we’re at a social gathering, and for humor someone decides to tell jokes about how mom’s place is in the kitchen, or that women are terrible drivers, or that women don’t belong in the workplace, or that girls can’t play sports. It’s not so funny anymore, is it? Old-fashioned stereotypes hurt. So why are we letting Similac off the hook with this supposed comedic material? It’s hardly amusing when dads get drug through the mud with a hurtful and cutting stereotype. You could apply this same theory with any ugly stereotype – there’s always one side that isn’t laughing. Had Similac employed a bit of empathy, or really thought this video through, that snide joke wouldn’t and shouldn’t have happened. 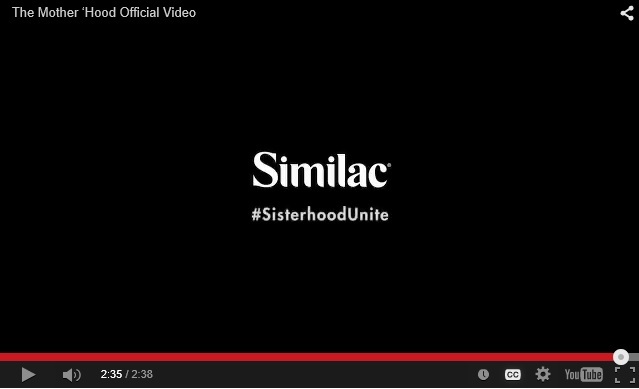 With a video sandwiched by a title like “The Mother ‘Hood Official Video,” and a hashtagged ending like #SisterhoodUnite, it underscores the desire of Similac to stubbornly want it both ways. It’s like Similac is saying, let’s use the word parent so we look like we care about dads, but we really mean mom. The campaign’s mission is to bring people together, but sorely misfired elsewhere, too. To be sure, lest you think this is all about dads, Similac’s video gaffe is evident in other areas. Check out the poignant comment on Similac’s Facebook page from Erin Hernandez, who accurately points out another Similac fumble. Much like the way the video’s playground gathering forgets the stroller, letting it roll away, Similac squarely does this with dads too, which could result in a costly mistake as Similac watches dads potentially reach for a different brand name. Please, don’t take our word for it. Others have already taken to the Internet and social media, weighing in on this campaign. “Dads in an ad about baby formula wearing babies and rocking childcare! Then the tagline is ‘Sisterhood of Motherhood.’ Um, what?,” said Dads Behaving Dadly, a site exploring the actions and emotions of being an involved father. Check out what geekdad.com says about this marketing mess, and here’s more from daddydoctrines.com. Even though Similac has no practice of talking to dads through its marketing message, it’s going to have to start listening. As you can plainly see online, things are starting to mushroom, and It can’t ignore this crowd much longer. If Similac really wanted to address the breast vs. bottle debate, that would have been fantastic and much needed, but Similac went about it all wrong. You know how parent magazine ads commonly drop the ball, claiming to be for both parents, yet the overwhelming majority of its content and ads only speak to moms? Well, in one clumsy case, we noticed an issue with one story’s headline forcefully speaking only to moms with something like – “Hey mom, here’s some ways to shush that baby” – while the very next article slammed dads who should be more involved with child-rearing. The magazine is its own enemy: reinforcing negative behavior and age old stereotypes through its headlines, stories and advertising, then unfairly ripping dad for disinvolvement. Talk about a vicious cycle of recklessness and irrationality. Such madness is like a peewee coach only instructing the boys on the team, and then looking at little Jane and telling her she’s terrible at sports. And now we have Similac, who uses a tagline, video, website, social media and overall campaign to – either intentionally or not – reinforce the old fashioned, inaccurate and irresponsible stereotype that dads don’t feed and/or parent kids. While trying to bring people together, Similac drove a deeper wedge into the mom vs. dad divide, by totally excluding dads from a marketing message. Dads can’t breastfeed, but they can bottle feed, and Similac had a chance to capitalize on this with what could have been a creative campaign. Instead, Similac spit up all over the burp cloth. For consumers (which includes both moms and dads, Similac), it has also made for a clearer choice between the big two formula companies, Similac or Enfamil. Imagine the uproar if there was a sudden, national movement to call the PTA, the Father-Teacher Association. No one would stand for this, because it would be wrong. So why does Similac get away with similar nonsense? 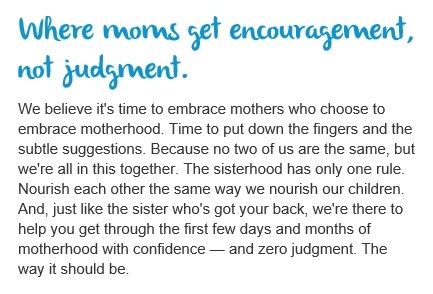 Similac should know as much as anyone else that the world of babies is not a sisterhood.